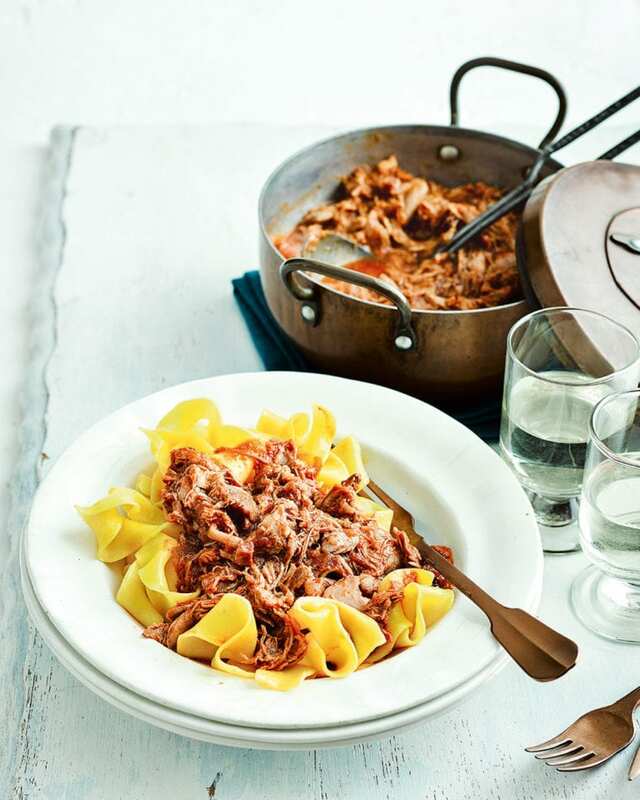 This gorgeously rich, slow-cooked duck ragù couldn’t be easier to make and is great for using up leftover gravy and stock. Heat a large, wide casserole over a medium high heat. Brown the duck legs on both sides until the skin is crisp (in batches if you need to) then set aside. Wipe out most of the fat, turn the heat down to medium and brown the pancetta. Set aside with the duck and again wipe out most of the fat. Turn the heat down slightly, then add the onions and cook for 10 minutes until softened and golden. Add the garlic and cook for a further minute. Add the wine, turn up the heat so it bubbles and cook until reduced by half. Add the passata, gravy, stock, bay leaves and rosemary (if using), then bring to the boil and return the duck and pancetta to the pan. Cover and reduce to a simmer for 2 hours 30 minutes or until the duck is very tender. Shred the meat, discarding the skin and bones, then season. Cook the pasta according to pack instructions, drain and toss with the ragù to serve. This recipe is a bit special. It’s a time investment but makes enough for 2 meals that each serve 4. To store, cool the remaining ragù completely, then transfer to an airtight container or freezer bag and freeze for up to 3 months. Defrost in the fridge overnight and gently reheat in a pan until piping hot.